Written by Soeren Eberhardt-Biermann on 19 April 2010 . 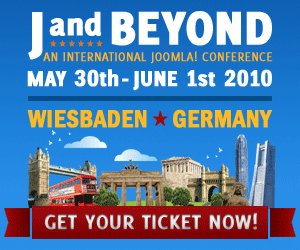 This year's probably biggest event in the Joomla!-world is "J and Beyond" - an international Joomla! conference, which will be held from May 30th through June 1, 2010 - near Wiesbaden, Germany. We have a draft version of our time table and it depends on the community proposals what we do in detail on each day. At the moment we are planning a keynote on each day on a special topic. On Sunday we are planning 3 rounds of 5 parallel sessions with each round lasting approximately 1 hour with a social event in the evening. Monday starts with a keynote followed by 2 rounds of 5 parallel sessions with each round lasting approximately 1 hour. After Lunch we have 1 round of 5 parallel sessions of approximately 1.5 hour and a longer second round lasting 2 hours. The day concludes with the J!Oscars event in the evening. Tuesday starts as the other mornings with a keynote, then a round of 5 parallel sessions lasting approximately 1 hour. After Lunch two rounds of 5 parallel sessions of 1 hour and 1.5 length. J! and Beyond will conclude with a closing session and a schedule finish to the event at 5:00 pm. Between the sessions we have a lot of free time to discuss in small or larger groups. Beside the Program we offer free rooms for spontaneous sessions or talks. Although there's no final schedule, you can view a list of proposed talks and sessions - it includes two talks about VirtueMart (by Thomas Kahl). The conference will see many "famous" people from the Joomla!-World and it's definitely worth the 99€ for one ticket (for the whole 3 days, including food&drinks). Written by Soeren Eberhardt-Biermann on 01 March 2010 . "Using Joomla!" is a new book written by members of the Joomla! Leadership Team. It's meant to help newcomers quickly learn the basics, while developers with Joomla experience will pick up best practices for building more sophisticated websites. The book also covers the basics of setting up and working with VirtueMart, so I just wanted to mention it here. O'Reilly has also published an iPhone App along with the book release. Make sure to check it out! Get 30% discount off the book price!! You just need to register&login and then you'll find the coupon code in this article. As a registered user you can purchase the book for 30% less. Just use the Coupon Code "ABF09". Written by Soeren Eberhardt-Biermann on 15 December 2009 . Currently Rick, Max, Oscar and other developers are doing their best to "convert" VirtueMart code according to the MVC paradigma. You can always check out the latest nightly build by downloading it from here. Written by Soeren Eberhardt-Biermann on 09 December 2009 . Now that Joomla! 1.5 is available for quite some time, we finally switched our main site to Joomla! 1.5. The upgrade turned out to be easier than we thought. In the end it was just plugging out the old site and switching on the new site. The component mtwMigrator did a great job in helping us to migrate the data form the old database to the new one. Even the comments from jomComment were automatically transferred. Very easy. I decided to keep the template now, before we think about a redesign. Converting it to J! 1.5 was already done when we upgraded the extensions site. You might also have already noticed our new links?! For the first time we're using search-engine-friendly links here on virtuemart.net. You can access the downloads now via /downloads. Nice, isn't it? The frontpage got a clean "redesign", it was overloaded before. Now it's easier to find your way to the information you need. But what do you think? Do you like the new links and frontpage? Written by Soeren Eberhardt-Biermann on 16 October 2009 . Joomla! 1.5 is available since January 2008, but a lot of sites are still using Joomla! 1.0 as base installation. I think this is mostly because upgrading to Joomla! 1.5 isn't trivial at all - components must be checked for compatibility, templates must be converted and a lot more. But more and more site owner are migrating to Joomla! 1.5 (especially because Joomla! 1.6 is probably coming next year). That's why we decided to take the step and started migrating our Extensions Directory. Luckily there weren't any components used that haven't been ported to J! 1.5 yet. The new SOBI2 version can be used even without legacy mode, so it was no difficult "migration". Everything went smooth and no data got lost.